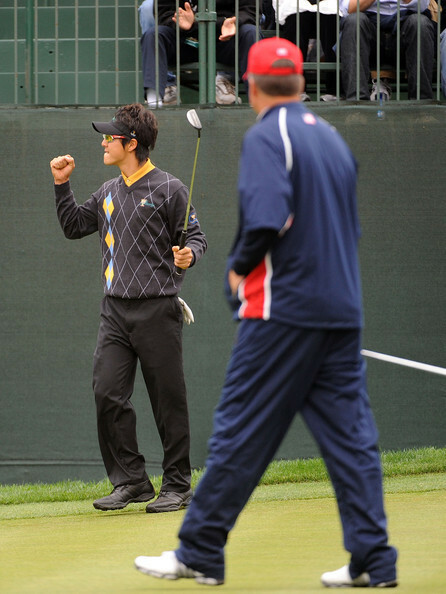 One of the most discussed names at the Presidents Cup was also the most confusing to pronounce: Ryo Ishikawa. If there were an MVP for the losing International team, it would be Ryo — a Greg Norman captain’s pick, the one that actually turned out brilliantly. Ryo’s inexperience was questioned — he just turned 18 last month (what were you doing at that age?) and hadn’t played in the team format before. [H]e’s a young kid that we have all sat back and read about for months and months and months about how good he is, and playing well in Japan and winning in Japan is great, but stepping up to the plate on the big stage and getting thrown to the wolves against Tiger Woods on Thursday, and then to bounce back the way he’s bounced back; there’s not too many. Then, pitted against the oldest guy in the field, 49-year-old Kenny Perry, in Sunday’s singles match, Ryo won 2-up. Because he’s old and Ryo’s young, Perry also complimented the maturity of Ryo-san. I’m retired. I don’t talk anymore. He sent me right into retirement, that kid…[H]e’s very calm, very mature for an 18-year-old…He played awesome. I threw a lot at him. I knew on the first hole I was in trouble, I hit it in two and he laid up and hit it 25 feet from the hole and he poured it in there like it was nothing. The match was on. We had a good fight. We had a good battle. Hopefully Ryo’s Asian-ness will keep him grounded and we will see him win major championships for many years to come. I’m hopping on the Ryo Bandwagon.